A simple, tasty and gluten free dessert option full of flavour and texture. Try changing the fruit in the recipe to take advantage of the seasons! Place the light brown sugar and FLORA Buttery into a large pan on a medium heat. When the sugar has dissolved, add the apples into the pan and cook for 5 minutes. Then add the water and cook the apples for a further 5 minutes or until the apples start to soften. Add the tinned plums and cinnamon, cook for a further 5 minutes or until the plums start to break down. Remove from the heat and mix in the lemon juice. Set aside. Place the flour, sugar and almonds into a bowl and mix well. Add the FLORA Buttery and rub into the flour mixture. Continue to do this until the mixture resembles breadcrumbs. Spoon the mixture on a baking tray and bake for 15 minutes or until golden brown. 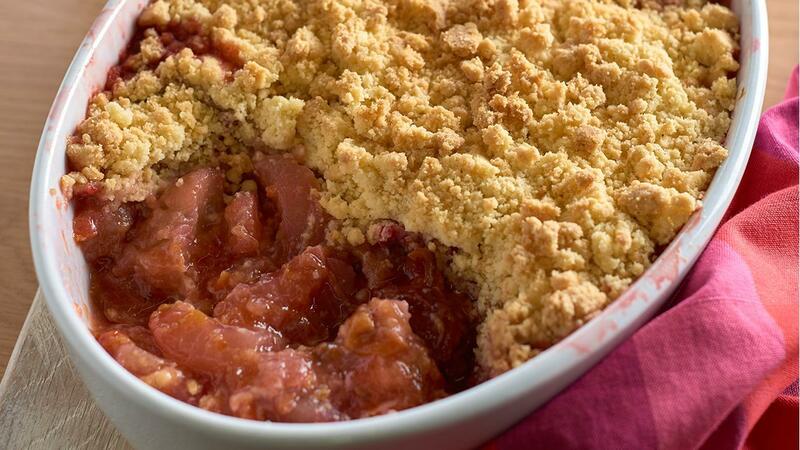 Stir the crumble every five minutes so that it cooks evenly. Evenly spoon the apple and plum filling into a gastronome tray. Cover the apple and plum mixture with the toasted crumble. Bake in the oven for a further 10-12 minutes or until the filling is hot.